April 10, 2011. It had just rained when we went to the Shirley Miller Wildflower Trail in North West Georgia. 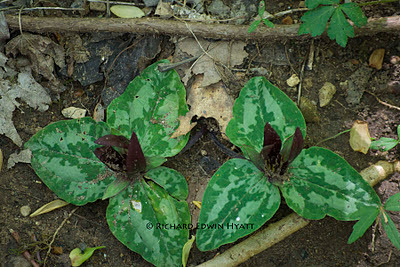 This was not the first trip during the Trillium bloom. That was in the Spring of 2007. At Mountain Nature & Wild Bird Supply we had received a new book to sell. It was called Favorite Wildflower Walks in Georgia, written by Hugh & Carol Nourse and published by The University of Georgia Press. We still sell this book at Mountain Nature. But, the Trillium adventure started with that book. I can highly recommend it to anyone interested in finding wildflowers in Georgia. The dates of the most active wildflower season are just right. And, there great descriptions of Trilliums and other wildflowers to be found in it. If you are interested in purchasing this book come by Mountain Nature & Wild Bird Supply, 104 North Main Street, Clayton, Georgia. Or give us a call at 796-782-0838. At Mountain Nature you will find all sorts of things "Nature".